The Google Photos site is now starting to show an option to allow you to merge faces in your library. Photos since the beginning has had facial recognition built into it and has done a reasonable job of helping you identify people in your albums and tagging them. The challenge with it has come with age progression of children and photos of peoples at odd angles. It seems that the Photos team have be doing a bit of work on the Artificial Intelligence and Machine Learning algorithms on the feature. On the Google Photos site, if you go to the Albums tab and click on People & Pets album, you will see a banner at the top of the page with suggestions of faces to merge under the tag for that person or pet. Through the use of Machine Learning to detect apps that impersonate, have inappropriate content or malware, Google removed over 700,000 rogue apps from the Google Play Store, taking 100,000 repeat offender developers along with them. The injection of ML can find patterns that detect bad behaving apps quicker than human inspectors, resulting in a 70% increase in removing of apps from the Play Store over the previous year. Not only did we remove more bad apps, we were able to identify and action against them earlier. In fact, 99% of apps with abusive contents were identified and rejected before anyone could install them. The end result is that the Play Store, while still not perfect, is a far safer place than it was this time last year and it will only get better as the Machine Learning models get smarter. Microsoft has rolled out another update to Microsoft Cortana, their personal assistant app & service, for Android. The update is version 2.9.10 for those keeping score at home and should be hitting devices with the Assistant installed over the course of the next few days. There are several improvements in this update, the most visible of which is and enhanced upcoming view for better calendar and missed reminders management. Now calendar events are more discretely listed in the Upcoming page which makes it easier to find upcoming events and reminders. There is also a new “Here’s what I can do” card at the top of the Upcoming tab to help you with some of the commands that you can give to Cortana. Smart Suggestions for tasks have also been improved in this update. These include the ability to have a reminder added or an event added. Google has rolled out an update to Google Drive that brings a new, Machine Learning-backed Quick Access panel to the app. Machine Learning is something that Google is rapidly deploying in all of their products, from G Suite to Google Cloud Platform. The good news is that everyday users can also gain the advantages of ML in the everyday apps they provide. This feature rolled out a few months ago for those who are G Suite customers and principally what it does is use a wide set of patterns to determine the files you need to access quickly. This isn’t just your most recent files as that’s fairly mundane these days. No, this looks at things like your calendar or activity on your Drive to bubble up the files you are likely to need. For Quick Access, however, we constructed thousands of simple features from the various signals above (for instance, the timestamps of the last 20 edit events on a document would constitute 20 simple input features), and combined them with the power of deep neural networks to learn from the aggregated activity of our users. By using deep neural networks we were able to develop accurate predictive models with simpler features and less feature engineering effort. It is a pretty impressive model and frankly, it works just as impressively. Looking at a meeting I had on my calendar, it bubbled up a Docs file that I had been using for notes around this particular meeting. I didn’t have to search for it. As you use Drive and other Google apps like G Suite (which includes the likes of Gmail, Calendar and of course Docs, Sheets and Slides), it will learn you better to give you more personalized results. 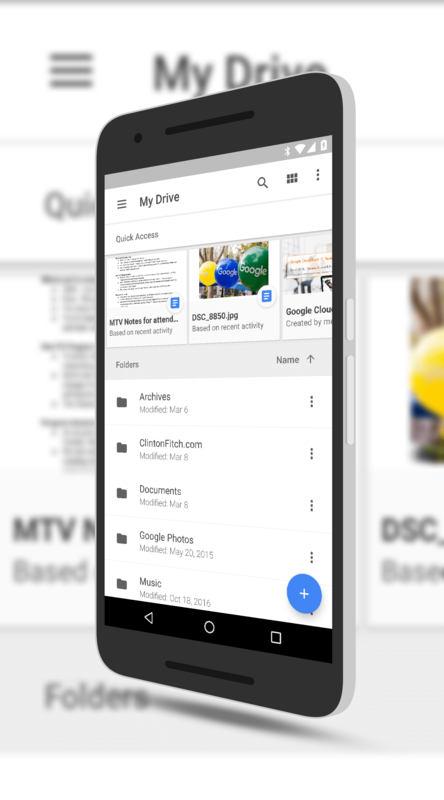 For Quick Access to work in Google Drive, you need to have the latest version of the app on your phone or tablet. The feature should be enabled by default but if not, you can go into Setting to enable it (or disable it). You can read more about it on the Google Research Blog.